Hotelogix is a property management solution for streamlining every critical process of the hotel, allowing for the smoother front desk, POS, and housekeeping operations. It empowers users to perform many tasks simultaneously. The system is designed to aid both old and new hotels by giving them a platform for matching the dynamism and versatility of the more resourceful and bigger hospitality businesses. By offering advanced technology at an affordable price, Hotelogix is extra useful for hotels that cannot afford costly applications. Instead, the system enables budget restrained businesses to grow faster in terms of both operation and revenue aspects. The system’s PMS is aimed towards empowering independent owners of properties to drive their business into a better direction. With just a few minutes, the setup would be done and users are then able to enjoy their cloud-powered platform. It’s also simple to operate which eliminates the need for the staffs to consume a lot of time using the system and focus on more important tasks instead. Hotelogix is mainly an innovative interface for front desk that serves as a centralized location for controlling every hotel operations. It can also be customized to better suit the unique needs of each hotel. Hotelogix aids users in enhancing their up-selling opportunities through a wide range of helpful features for managing the hotel. Examples of said features include OTA’s, GDS, direct booking from websites and Facebook page, and a reservation dashboard which is connected with the Metasearch market. 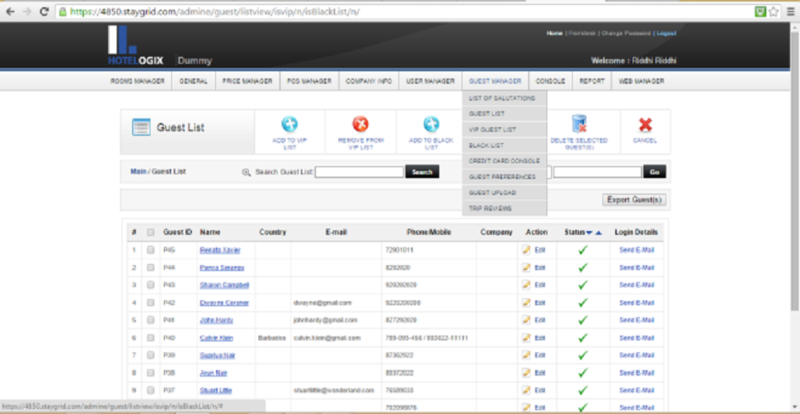 There is also an auto-fill feature which eliminates the need for manual entry of information for the returning guests. It also provides users with their history and applies promo codes and special discounts for them as well. Hotel’s growth and performance can be monitored because there over 100 available reports provided by the system. The reports can easily be emailed, filtered, printed, or downloaded in various formats such as CSV which provides users with an opportunity for a more in-depth analysis. Management dashboard gives you relevant information such as KPIs which is a useful component in making a better-educated decision on various aspects such as source/revenue/market segment analysis, RevPAR, occupancy, best 5 OTA performance, business-on-books, and others. The system has a built-in OCR scanner that can automatically capture guest information from scanning their documents. And with the centralized guest profiling and report management feature, all group hotels can be managed through a single system.